Monica Kendrick points to collages made by her fourth-grade students in memory of Sandra Parks. Published Jan. 6, 2019 at 5:01 p.m.
"Every time I hear of something happening in the central city, especially if something happens to a kid, I am always praying that it's not one of our kids," said Levells, the eighth grade teacher at Keefe Avenue School. "I have a rambunctious group of teenagers in my classroom, and as I looked at them … I could see in each of their faces that a little bit of their innocence was being taken away while that news was being relayed to them," he said, with a weary heaviness. "It was one of the hardest things I've ever had to do in my entire adult life." "Our job is to stabilize the situation, support the kids who need immediate support and get things back to a state of being predictable," said Dena Radtke, MPS manager of school social work and transition services. with emojis to honor their classmate, Sandra Parks. 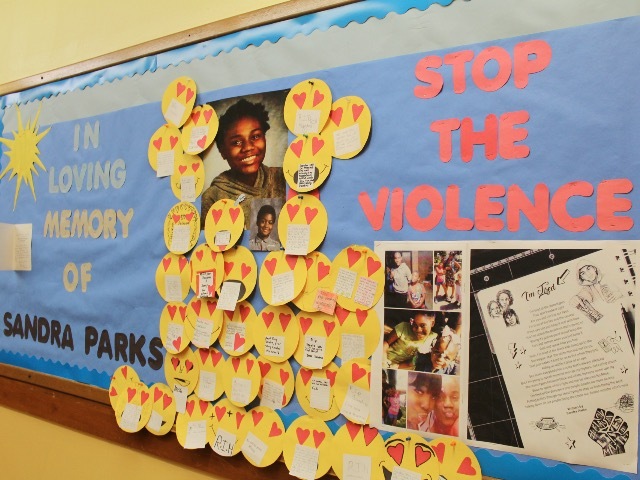 When the crisis response team members arrived at Keefe that Tuesday morning, they informed staff of Sandra's death and crafted the message to share with students. Pinter said it's important for the news to be delivered in a sensitive yet factual way. Monica Kendrick, the fourth grade teacher at Keefe, was distraught after learning of Sandra's death. She was very close with Sandra and now teaches her younger brother. "Here, that day, I couldn't function," Kendrick said. "I broke down and couldn't tell my class what happened. (The crisis team) came in and took over my class … To have that type of support was amazing." Levells said the response among students in his class varied. "A few totally broke down and got pretty hysterical … some were more stoic and calm," he said. "They could be in the middle of a social studies class, surrounded by their peers, in a very safe environment, but they don't feel that. They don't feel safe, which affects how they think … They're in the back of the brain, worrying about stuff," Pinter added. "(The training) gave us strategies … to help cope with the stuff the kids are experiencing and struggling with … to understand why they may be acting out," Kendrick said. "Sometimes when they're angry, it comes out very nasty to us, the teachers … because they don't always know how to deal with the emotional stuff that's going on in their lives," she said. Keefe is also part of School Community Partnership for Mental Health (SCPMH), a collaborative initiative that increases schools' capacities to provide mental health care to students by partnering with community providers. "Some have now learned that life can be taken at the drop of a pin, even if you're not doing anything wrong," he said. "I think there are some who realized that, and thought, 'We better start doing things that are right … maybe try to do a little bit better and be kinder to each other.'"